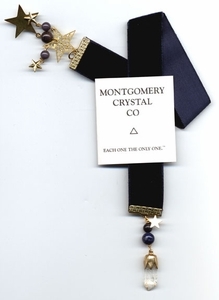 We've combined a super clear Arkansas rock crystal with sodalite, golden stars, blue jade and purply-blue goldstone connected by deep navy [washable] velvet - into an Illuminator TM bookmarker for your reading pleasure. Overall 16 1/4", this luxury will not mar your books - makes an accurate pendulum if you are so inclined, a great gift for the man on your list, too! Sample shown - yours will be equally gorgeous.